My girls are growing up. Its a bittersweet time as a mom, but on the practical side they want their rooms to reflect the fact that they are getting older. My girls had shared a room when they were younger, so we had worked hard to make the room work for both of them. 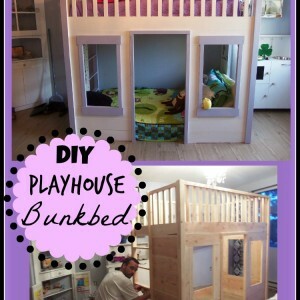 One of the ways we did that was to have my husband build this play house style bunk bed for them. I loved it, and my husband built it, so I just could not see parting with it. We recently moved one of my girls into another room, so they could both have their own as they get older. My oldest daughter (tween age) stayed in this room, and wanted me to get rid of the bunk bed. It took up a lot of room, and she felt like she had grown out of it. This is the bunk bed my husband built my girls when they were younger, and shared a room. 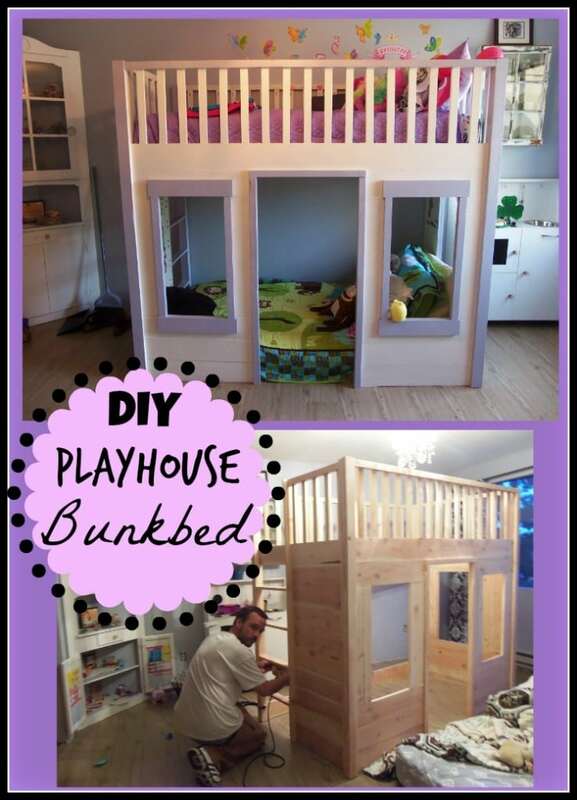 You can read all of the details on how he made this bunk bed for our girls here. This is also the before version, when it was still a bunk bed. I started making plans for where we could store it. And then it happened. She started asking her dad to build her a walk in closet and I saw my opportunity. What if I could convert that bunk bed into a walk in style closet in the corner of her room, and make it cool enough that she would want to keep it. My imagination started swirling and we did it. She has plenty of closet space in her room, but needed more organization of her stuff. As she is getting older, she has grown out of the toy stage, but started collecting accessories (jewerly, hair bows, scarves, purses etc.). She loves Paris, and decided to theme her room around that. 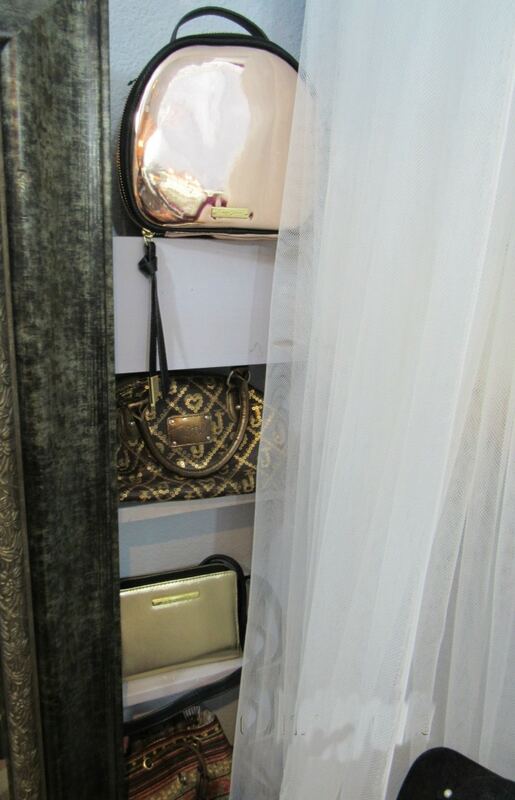 This made it easy to make it an accessory closet, as it went well with the rest of the room. 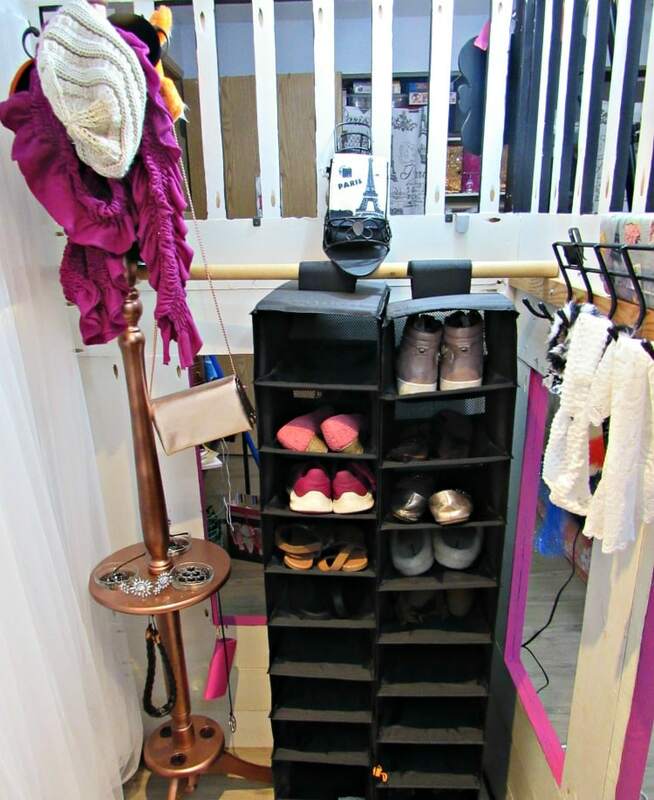 You could take this idea and use it to add more closet space to a room in general. You would just add closet rods around the inside, and boom – you have a stand alone walk in closet in your room too. 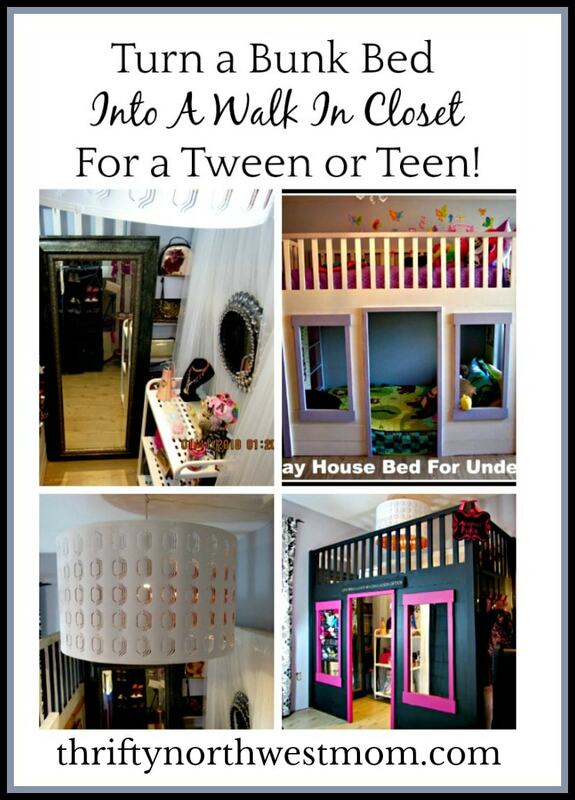 Here is what we did with my daughters room to create this stand alone walk in closet on a budget. Our bunk bed already had walls, so it was an easy conversion. If you have a more traditional type of bunk bed you may have to get more creative (like adding curtains all the way around). We started by removing the mattresses and bed slats, so you could stand all the way up when inside. If your structure is not very stable when you remove these things, you will want to add some L brackets to the top and bottom of each corner, or stabilize it by reinforcing where needed. We then moved it into a corner, to look more like a walk in closet. A hanging rack we picked up for $3 was mounted to the outside of the structure, and it provides a spot to keep school backpacks and coats off the floor. 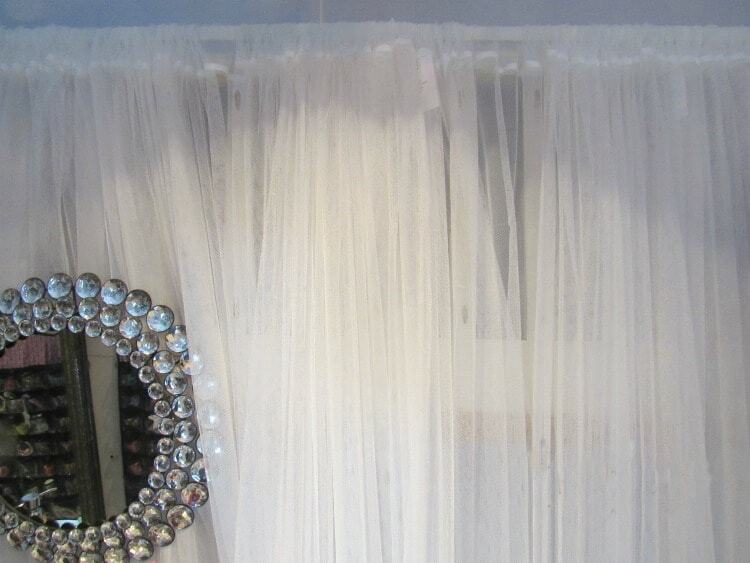 The next step was to line the back wall with curtains, to glam the space up a bit. We found these ones at Ikea for $5 per set of 2. We bought two sets to cover the back wall. 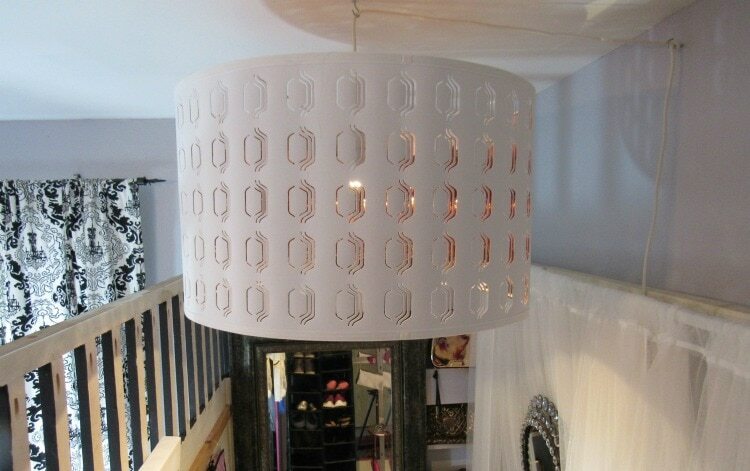 We also added this chandelier to the middle of the closet. We chose this one that you can hang anywhere (vs one hardwired to the ceiling) so we could move it if we do something new with her room. We also found this one clearanced out for $20 at Ikea. Here is another option that would be fun for under $20. 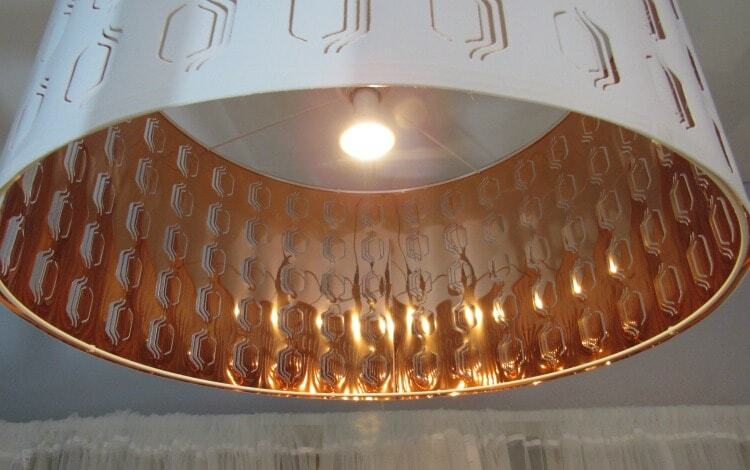 My daughter loves Rose Gold, so this chandelier was our inspiration for her closet space. 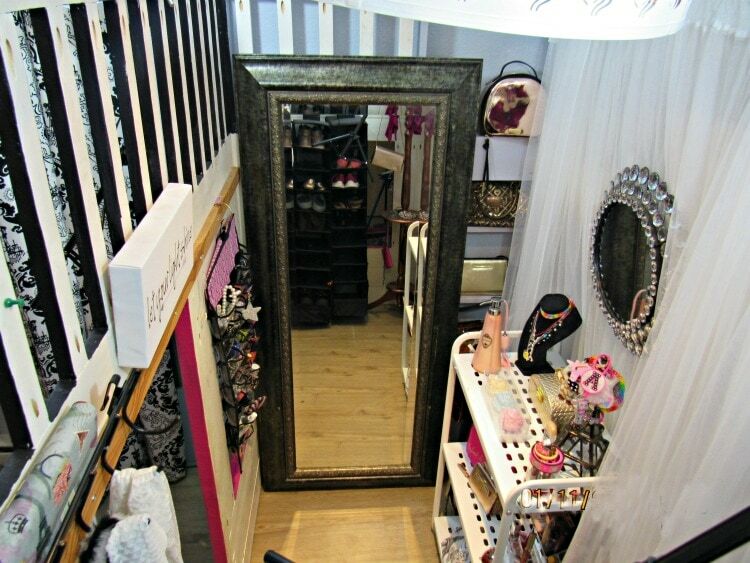 We then added a full length mirror. I already had this mirror, so we used what we had, but you can find them for under $20 if you need one. Adding this little set of shelves on casters, so she can move it around (we had this already, but I originally bought it at Target for around $15). Here is a similar one for $15.99. We found a blinged out mirror at Hobby Lobby, and put that above it. She organized her shelves with the same Paris theme she decided to decorate her entire room with. We also added some simple shoe organizers (we got ours for $5 per set, so $10 total spent on organizing shoes). We just added a wooden dowel across the width of the bunk beds, and attached the hanging shoe organizers to that. I had this coat rack hanging around my house, and had planned to donate it initially. 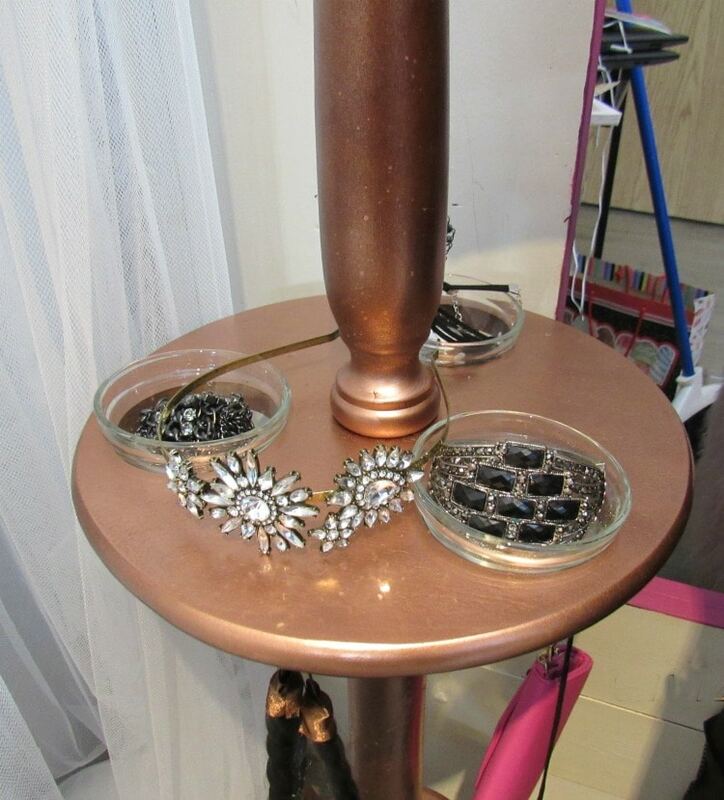 Then I saw a can of rose gold spray paint, and it inspired me to spray the old coat rack with the rose gold paint. I added some small glass bowls that I got for $1 for a set of four at the Dollar Store (so $0.25 each), to the holes that the umbrellas went through. She can now hang her scarves and hats from the racks at the top, and place small jewelry pieces in the bowls. It was slim, so it ended up being the perfect piece to put in here and not take up much room. The project cost me $6 total. If your looking for something like this, this coat rack is $20, and could be sprayed any color and fit in a small corner to hang many items off of. We utilized what used to be the ladder to climb into the top bunk, for purse storage. We just set one purse on each ladder landing, and it was the perfect display for her purses. This was our splurge item. 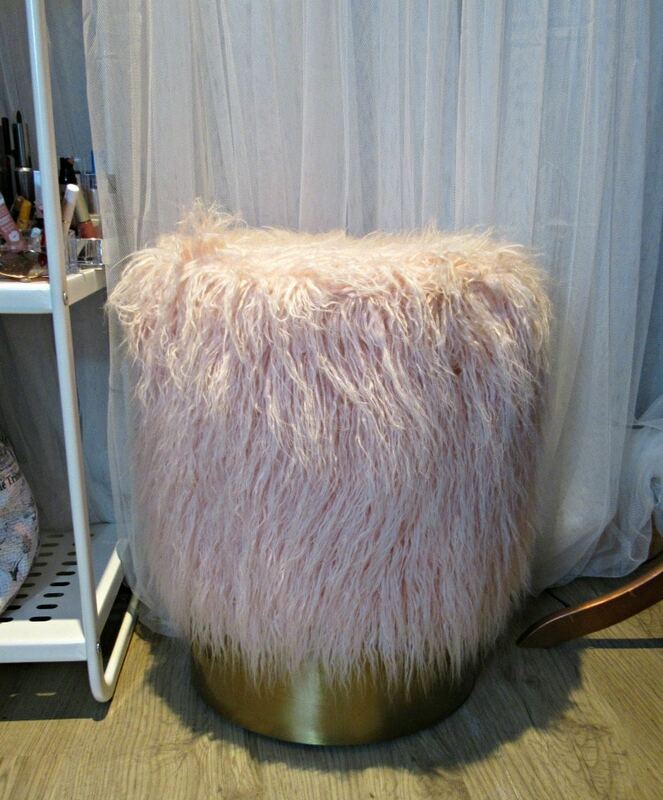 Its a glam stool for her. We found it at Target on sale, and there was a Cartwheel coupon for it. There was a small scratch on the gold bottom, so we asked one of their managers and they gave us an extra discount. She is able to move this from her desk outside the closet when she needs to do homework, to the inside of the closet if she wants to put on shoes or play with makeup, etc. Here are some similar options, starting at under $25. 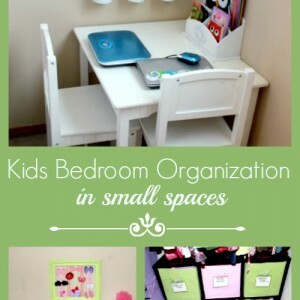 Kids Rooms – How To Organize Your Kids Bedroom & DIY House Bed Under $200! 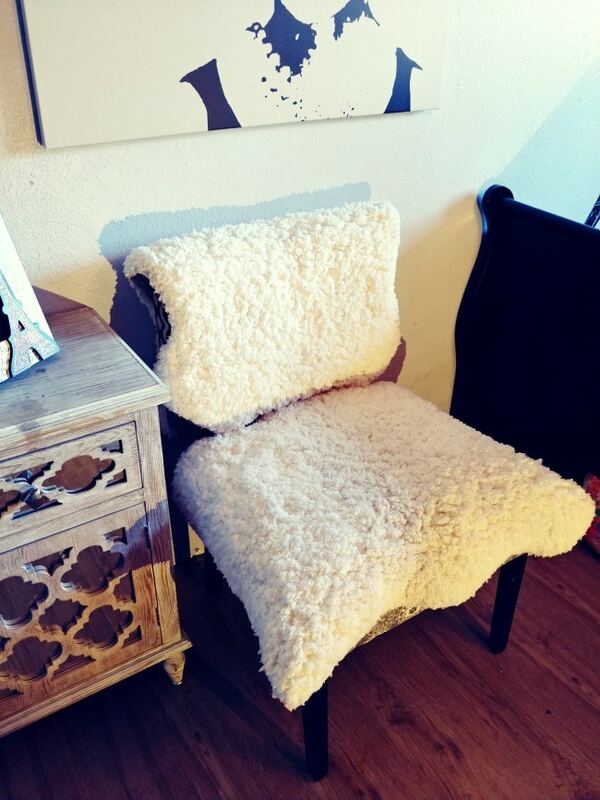 Chair Recovering Hack (Using Faux Fur Rugs)! 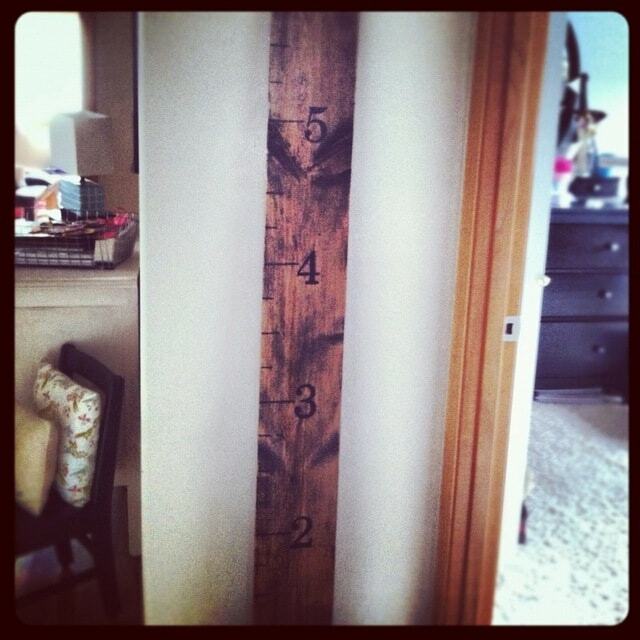 DIY: Pottery Barn Inspired Growth Chart – Frugal Version!